Time to watch the diet again after 'chow down' of the glorious festive food! Saute onion and garlic in 2 tablespoon olive oil. 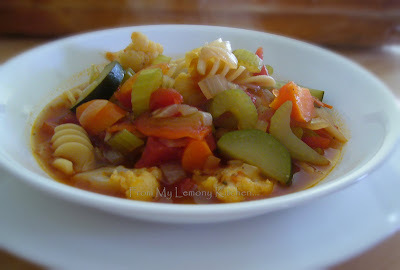 Add the chunky cut vegetable with can tomatoes. Stir for few minutes. Add the mixed herb and stock. Bring to boil and add pasta. Season to taste.